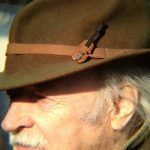 Photo: Walter Lloyd (1924 – 2018) – on his 90th birthday. The funeral of my dad, Walter Lloyd, took place yesterday, 24th January 2018. It was a memorable occasion. About 250 people came to pay their respects, and his funeral wagon was pulled by two Fell ponies from his chalet at Millerbeck to St Mary’s Church, Staveley-in-Cartmel. His last trip was accompanied by a pipe band (The Cumbria Gaita Band) and The Lakeland Fiddlers, followed by a session in The Newby Bridge Hotel. The church service was a family affair – Walter’s grand-daughters Eleanor, Marian and Florence made spoken and musical tributes, his son Tom read a poem, son Bill spoke, and daughter Caroline chose the final music. Son-out-law Alex made the music notation for The Parting Glass and played the piano. Great grand-children Innes and Scarlett were there, but probably won’t remember it. Walter had one last trick up his sleeve…..the gravedigger James discovered that the allocated plot in the churchyard was solid rock, and it took almost two days to dig the grave using a jackhammer, so dear Walter now has a rock-cut tomb for his final resting place. Sincere thanks to the men, women (and child) from the Coppice Co-op (http://coppicecoop.co.uk) who stepped up to help to fill in the grave. Thanks to them, our last memory of Walter’s funeral was a tidy gravemound, covered in flowers. On behalf of Walter’s extended family, I would like to thank all those who came, from all parts of the country and even from across the water, to pay their respects, and to make it a truly memorable day. Rest in Peace Walter. Several people have asked me for copies of my funeral address, so I have included the text below. I ran out of time during the service, so I cut the speaking short, but this is what I would have said if I had time, and even this barely scratches the surface…. Walter used to tell me that the best way to die was to die young, but to leave it as late as possible. I would say that he just about managed that, at the age of 93. He made many mistakes, as we all do. He was not perfect – nobody is – but with Walter there was always the willingness to try, the willingness to take a chance, the willingness to follow his nose, to take a leap in the dark with a smile on his face, and to take the disasters and mistakes with exactly the same smile as he took his successes. Most people here have known Walter for about 30 years, since he first came to Cumbria. But he was already 63 before he arrived here, so I am going to talk mostly about his life before he became a Cumbrian. He was born and raised in West Cornwall, in the farming village of Zennor. He spent most of his childhood, including time when he should have been at school, helping on the farms, and from the age of 9 he spent a lot of time wandering over the moors with his donkey. He studied at Cambridge University, but the war interrupted his studies, and he joined the Royal Navy as an Ordinary Seaman. He served off the Normandy beaches at D-Day, and before that on the Arctic Convoys, and only last year he was very proud to receive a medal from Vladimir Putin in recognition of that service. (Better late than never.) After D-Day he was commissioned as a Sub-Lieutenant and served in Minesweepers in Burma and Malaya, where he given his own command of one of the smallest of warships: an MFV – Motor Fishing Vessel. I asked him once what it was like to be under fire, and he told me that his worst experience came a few days after the Germans had surrendered. He was at anchor in a Norwegian harbour and he and a friend decided to steal the German Commandants tender – a beautiful little clinker-built boat called a Norwegian Yole. They rowed across to it in the early morning, cast off the mooring ropes, and were half way back to their ship when the Norwegian army opened fire on them. The Norwegians wanted their beautiful boat back because the Germans had stolen it from them in the first place. Fair play. That was the closest he came to getting shot, and the bullets came from his own side…. After the war, he went back to Cambridge University to take an MA in Agriculture. He married my mother, Vivienne, and started livestock farming on a small family farm 1000 feet up in the Pennines in Rossendale, East Lancashire. He tried, and mostly he failed, to make a living with sheep, pigs, sucklers and dairy cattle. He brought the very first tractor and silage machine into the Whitworth valley, but before long he abandoned all those livestock enterprises and all that machinery, and concentrated on his Fell Ponies and Welsh Black Cattle – hardy breeds that lived on grass, and did not need a lot of looking after. He had to make a living to bring up his family, so in 1966 he took a job with the Rochdale Borough Council as a Civil Defence Officer, and he was sent on an Instructor’s course to the Civil Defence Corps Training School at Taymouth Castle in Scotland. I have a letter from the Commandant of Taymouth Castle from 1966, stating that Walter achieved the highest marks ever awarded to an Instructor from that establishment. That was high praise, because Taymouth Castle was responsible for training the Civil Defence Corps which at that time was made up of three hundred thousand people. In 1968, the Civil Defence Corps was disbanded. Walter could not bear to see all that skill and knowledge wasted, so he founded and directed a new organisation, National Voluntary Civil Aid Services, known as Civil Aid, and thousands of ex-members of the old Civil Defence Corps joined him. He became Chairman and Executive Director of Civil Aid, and this work took to him all over the country. He worked in Belfast at the height of the Troubles, he went to Geneva for International Civil Defence conferences, and more than once to Trinidad, where he studied hurricane disaster relief, and while he was there he made sure that he also studied drinking rum, and kaiso dancing with his new great friend and colleague in Emergency Planning, Victor Prizgar. Because of his extraordinary achievements at Taymouth Castle and Civil Aid, he was appointed Emergency Planning Officer for Greater Manchester Council, with an office on the same corridor as County Secretary and the County Treasurer, and a salary to boot. He had the job of developing a plan about what to do if the chemical works exploded at Runcorn, or what to do if a jumbo jet crashed in the middle of Manchester. In particular, as part of his Civil Defence work, he had to draw up the Emergency Plan for what to do after a nuclear bomb attack on Manchester. That work shaped his interests and his priorities for the rest of his life, because it led him to believe that over the long term, ecological and environmental catastrophe might not be so very different from nuclear catastrophe. That is why he became so interested in teaching about low-impact technology, portable shelters such as yurts, horse drawn transport, packsaddles, hand tools, rope making, weaving and felt making, woodland management, charcoal, coppicing, mass feeding, nomadism, surviving on your wits, and other aspects of alternative living. And Walter practised what he preached – he will be remembered as the only man in Rossendale who tried ploughing with his cows and milking his horses – and he really did – I know because I helped him. It was because of his job in Emergency Planning and his work with Civil Aid that he became involved with music festivals. In the early days of pop festivals, particularly the hippy free festivals, there was often a serious need for emergency feeding, First Aid, and good communications. He used the festivals as training opportunities for Civil Aid, so he was never short of young volunteers, (including me) and he had a backstage pass to every major festival in the country. 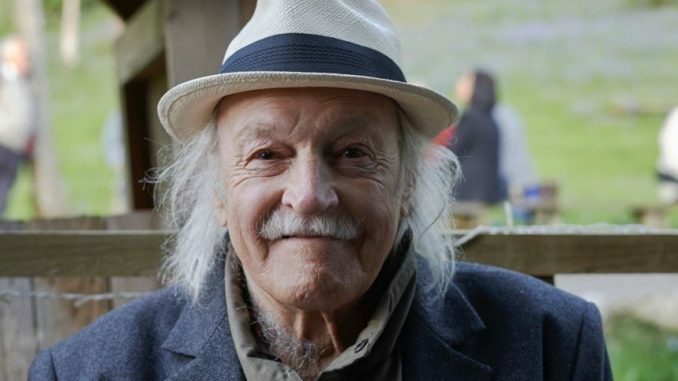 He was at the very first Glastonbury Festival in 1970; he saved some lives and picked up the pieces after a freezing storm of torrential rain destroyed the Krumlin Festival near Halifax; he embraced punk music by providng welfare services for the Deeply Vale festivals. At the 1974 Windsor Free Festival, when he heard that there were several thousand hippies on the site without food, water or shelter, he went out and bought an old fire engine, packed it with food and catering equipment and tarpaulins, and within two days he had driven it from Rochdale to Windsor with a crew of volunteers. He set up his feeding station, and mustered the Hells Angels to go to the old Covent Garden market and gather as much unsold food as possible. He served long lines of hungry hippies with chapattis and vegetable curry for three solid days. The festival had no water supply, so he took the fire engine into Windsor town and filled up the fire engine water tanks at the nearest fire hydrant, – and he got away with it. The salary from his office job at Greater Manchester Council was welcome, but Walter realised that he was not really fitted to office life – he much preferred the hands-on, freewheeling life among the festivals, musicians, alternative technologists, and his many Gypsy friends, and when the chance came he took early retirement, and a good pension, and began to branch out. Fell ponies and Welsh black cattle, tree planting, opening up old bridleways, registration of common land, building bow-top wagons, running alternative technology weekends, organising environmental action and frequent wild and wonderful all-night parties. By now, (1981) he was married for the second time, to Gill Barron, and as well as his adventuring, he was helping to bring up a second family. He was father to three families in the end – four of us children from his first marriage to my mother Vivienne, two step-children from his second marriage to Gill, and two bonus children from his longstanding partnership with Sue. Nobody is perfect, and we cannot pretend that Walter did not cause come serious upsets, but somehow, he and his various families managed to come to terms. In the last few days of his life, Walter said to me that he felt blessed that his family was still there to support him ‘even though he nearly destroyed it 50 years ago.’ which is a kind of remorse, or at least an acknowledgement. In 1987, after his second marriage broke down, he yoked up 5 Fell ponies to his bow-top wagon, left the farm in Rossendale where he had been for almost 40 years, and drove up to the Lake District. He parked up in my back-yard to manage Project Phoenix for the New Woodmanship Trust, which aimed to re-establish commercial charcoal burning in the South Lakes. He moved his camp from one woodland to another for several years, and became engrossed in small woodland management. He established a thriving willow growing business, Wally’s Willows, he developed a plan for an oak-bark tannery, he wrote a book about the hazel tree (unpublished), he started making woollen rope, he drew up plans to build a traditional cruck barn, built more yurts, wrote another book about bow-top wagons, (published) and became a trustee of a nature reserve and President of the North West Coppice Association. He was a founder member of the Bill Hogarth Memorial Apprenticeship Trust, and within a few years there were dozens of people who had benefited from his work – producing charcoal, and at work on traditional coppicing. He was proud to be associated with Gypsy people all his life. He was not a Gypsy himself, but his mother and his maternal grandfather had always been friendly with Gypsy people, so he was brought up that way. He let Gypsies and Travllers stay on his land, and he helped revive a number of Gypsy horse fairs. He joined the Gypsy Lore Society in 1949, and he first went to Appleby Fair in 1958. He hardly missed it for the next 60 years, and after he spoke up for the Gypsies at a public meeting in 1967, (when the Local Authority wanted to close the Fair), he was asked to join the Fair Hill Committee, a position he held for 35 years. He was shown how to build a bow top wagon by Old Joe Cannon, and in 1977 he travelled from Rossendale to Appleby with horses for the first time in a wagon that he built himself. He built at least 5 living wagons, and for 30 years, up until the age of 90 he slept every night in of the year in his own bow-top. You may wonder what drove him – ‘what was he on?’ as the saying goes. Well he didn’t smoke, he liked his wine but he drank very little, and he didn’t do any drugs at all, in spite of his long association with pop festivals and hippies. He did once plant some cannabis seeds in the flowerbeds in the reception area of the top floor at Greater Manchester Council, but that was just devilment, to see if anyone would notice. The gardener carefully watered them for weeks, until the Chief Constable spotted them and blew the whistle. Walter kept very quiet. So, what drove him? He did not need stimulants, apart from lots of black coffee and a drop of Trinidad rum. He relied on his energy, his curiousity, and a thirst for first-hand knowledge. He always wanted to know what was around the next corner, and if he did not have the knowledge, he would find out. He was lucky to have a hardy constitution, an extraordinary memory, and a stubborn personality. He had an insatiable appetite for reading, and a complete disregard for creature comforts. He took a lot of risks, but he managed to survive without serious injury. He would be the first to admit that he was a lucky man. I will finish with a quotation from Helen Keller. We will miss him, but we haven’t really lost him. He is still around here, but in a different form – in thousands of trees that he planted, hundreds of tools he collected, hundreds of books he read, hundreds of stories he told, thousands of laughs that he gave us, and countless memories he gave us. He was lucky, and so were we. I remember going to his Cumbrian a guided tour through his fields looking at his willow plantations and watching him making his own rope. I knew Walter when I was a teenager visiting his mysterious fell herd of horses in his farm in Shawforth, i lived on a farm across the valley. Walter was always kind and wise. Little did I know I was in the presence of such greatness ! It was an honour to have known him. His family have been blessed.